People can be rather blasé about safety in the home. We view our houses as a shelter and sanctuary from the cares and risks of the wider world. We put trust in them to offer us protection. Yet, according to RoSPA – the Royal Society for the Prevention of Accidents – every year in the UK more than 5,000 people die in accidents in the home and 2.7 million go to accident and emergency departments seeking treatment. But, as RoSPA points out, because the accidents happen behind closed doors in isolated incidents they rarely attract public and media attention. If this aspect of modern life registers little in the public consciousness despite its impact on the lives of so many people then we probably don’t pay it enough attention in our study of the past. The light of the vngodlie shall be put out, and the light of his candle shall not shine: the light shall be darke in his dwelling, and his candle shall be put out with him: yea full often shall the candle of the wicked be put out, and their destruction shall suddenlie come vpon them, so that all shall be horror, and full of darknes with them. O Lord, let not our candle be put out, nor the light that is in vs be turned into darknesse: but lighten thou our candle, and make thou our darknesse to be light: yea lighten thou our darknesse, we beseech thee O Lord, that we sleepe not in death, and by thy great mercie defend vs from all perils and dangers of this darke and dredfull night, and lighten & illuminate thou euerie darke corner of our habitation with thy light, that our candle go not out by night: for the loue of thy Sonne our Sauiour Iesus Christ: So be it. 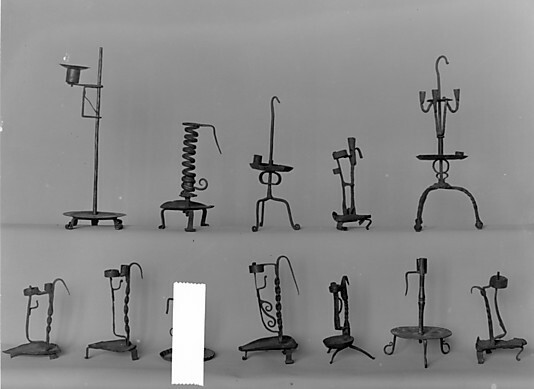 Various iron candleholders, Spanish, 16th century, Metropolitan Museum, NY. Several of these sixteenth-century candlesticks have hooks at the top that allowed them to be hung up in the manner Wallington describes. Another ‘wier candlestick’ incident occurred on 4 July 1629, a Saturday, when one of Wallington’s apprentices, Obadiah Seeley, took a candle to bed, which according to Wallington was “contrary to my commande…that he should take no candel to bead with him” – a revealing detail suggesting how householders attempted to manage risk. Obadiah “tooke a candel up in a wier candlest[e]ke with him and hung the candlesteke at the end of the beades head”. As before, the candle fell down through the wires and onto the bed setting fire to the bedding. Obadiah and another apprentice, Theophalas, his bedfellow, awoke to find their sheet and parts of their flock and straw mattresses on fire. Either through quick thinking or fear they used the natural resources readily available to them; Wallington recounts that “they pi**ed out the fier as well as they could.” Luckily this extinguished the flames because Obadiah – no doubt with considerable trepidation – had to wake his master to request another candle in order to light the way to find water; in the time this must have taken the fire could have spread beyond control. On being woken at 2 in the morning with this confession and request, Wallington, understandably, did “start up in my shirt” with a bowl of water in his hand; he was greatly relieved to find only ashes of straw on the ground. As he observes, the other contents of the room would have fuelled the fire; “for there lay baskets a tope one the bead and chips and lite woode lying heard by”. Candles represent the capacity for material things in the early modern home to generate ambivalent or conflicted attitudes and sensations. On the one hand candles offered light and warmth and, as a result, this object had acquired profound Christian meanings so that the actions of lighting and extinguishing could be deeply symbolic, representing the presence or absence of faith and eternal life. Yet, this ordinary domestic object also held an innate potential for destruction and untimely death. No doubt the kind of near-misses described by Wallington were relatively commonplace, part of everyday experience underpinning and fuelling the sensationalised reports in ballads and pamphlets of occasional calamitous fires that destroyed large parts of towns and cities. Woodcut from ballad: ‘The lamentable Burning of the Citty / of Corke (in the Prouince of Munster in Ireland) by Lightning: which happened the Last of May, 1622. 1) David Booy (ed. ), The Notebooks of Nehemiah Wallington, 1618-1654: A Selection (Ashgate, 2007). See pages 63-65 for the full descriptions of the incidents discussed here.